A striking and spectacular quote for those who thinks intellectually by Friedrich Nietzsche . I guess 85 % of people in the world would only think of a club dancing when they hear about it. We know that Music and dance are most dominant art forms for humanity. While music is the subject of many philosophical studies from time to time in human history. What is so special about music? Music is magical, it has healing power, it can cure disease. Well, I don't know more about music therapy. However, studies revealed that listening to one's favorite music can reduce depression. When we enjoy music or dance, what is happening is we tends to forget our problems. So the happy news about art lovers is that they are somewhat creative in life. Well this is not about music and arts. It is not a definition of insanity too. The quote points real intellectual attitude of a wise man. Ideally, for a positive minded person, he tends to worry less about life problems. 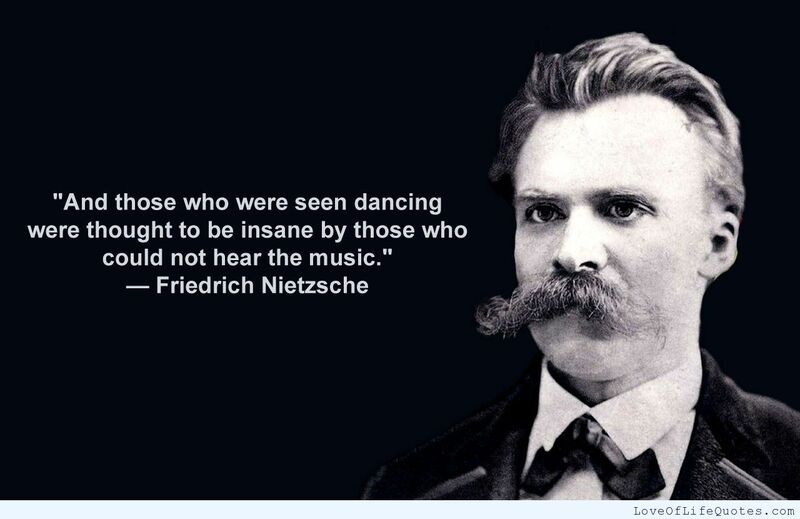 Here Nietzsche mentioned about dance is meant for celebration. A happy person enjoys his life. A normal man could not understand the depth of this saying. 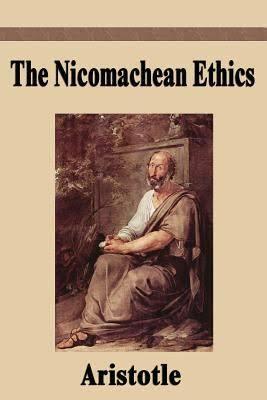 Like Aristotle and Kant,Many western philosophers are regarded as obscurantist. Obscurantism is the practice of hiding the facts deliberately. Being able to live a happy life in the middle of problematic life is almost impossible. But the good news is knowing that the idea is possible. Firstly we need to understand about the mind and its working. The human mind is a well-developed among all living creature on earth. We can think, imagine, calculate critical scientific formulas using our mind. Even though an exciting fact about the mind is its focusing ability. The more we focus on a thought, the more the stronger is the emotion regarding that thought. The more the mind think about a particular feeling, the more the stronger is the feelings. It is a kind of energy supply to the thought. Emotions and thoughts are just as the opposite sides of a coin. “A fight is going on inside me.” he said to the boy. "It is a terrible fight and it is between two wolves.One is evil - he is anger, envy, sorrow, regret, greed, arrogance, self-pity, guilt, resentment, inferiority, lies, false pride, superiority, self-doubt, and ego.The other is good - he is joy, peace, love, hope, serenity, humility, kindness, benevolence, empathy, generosity, truth, compassion, and faith.The same fight is going on inside you - and inside every other person too.”The grandson thought about it for a minute and then asked his grandfather,"Which wolf will win? "The old chief simply replied,"The one you feed." The lessen from the story is so simple. 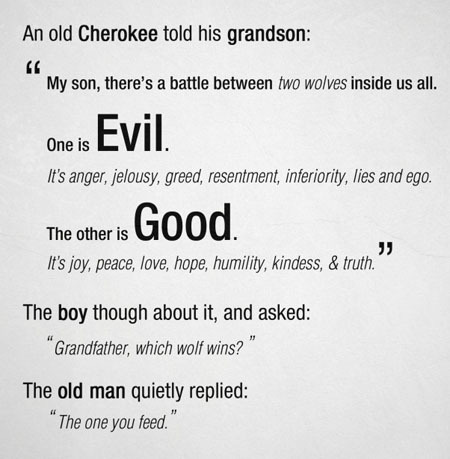 Always try to feed the good wolf. We all have both the wolves living inside us. Be courageous and faithful. A fight is always painful whether it is in a real Warfield or in the mind itself. But the fight is the essential part of life. So we have to do our best. Try to concentrate on positive thoughts . The more you concentrate, the more you focusing, the more fuel you give to your mind machine. Once you find out this works , then there is the light of magical happiness. So the learned wise man collectively enjoys the life. The society labels him insane just because majority can't accepts. Let's consider the life of Thomas Alva Edison, the inventor of the electric bulb. Know that he worked 16 hours a day? And he used to sleep only 4 hours . This is surely impossible for a common man. In an interview, Edison revealed that he had never worked in his life. He said he was only doing what he likes. He passionately enjoyed his 18 hour daily works. This is more than enough for a common man to judge him as insane. But what is important is Edison was happy about his life. He was curious, he was enjoying his experiments with the curiosity of an innocent child. Now we talk about the real insane person. Somebody looks weird, somebody doesn't care about anything. Ugly clothes, bad odor, doesn't even care about dressed or not. How does he think? What is going on his head? These are psychological questions actually. But we can assume something. There is a saying " Ignorance is bliss" meaning that an ignorant person is a happy person just like a child. So the insane person is kind like a child. Whose brain is not developed. Both the child and the insane person doesn't care about anything else. That is the source of their happiness for them. So what is the linkage between insanity and happiness? People spend so much time thinking what others think about them. People are keen to know what others says about them. They care a lot about it. And the truth is that nobody can live a life that makes everyone else happy. If you choose not to care about what others thinks, that is freedom. You can imagine that you have attained a certain amount of freedom. The touch of insanity. People likes you if u agree their opinions and it is impossible to agree all the opinions. We have to make a stand free from opinions and suggestions. Nobody is beyond criticism judgment. The greater you become the more others point their fingers at you. So many great men are killed in the world in history. Socrates, Abraham lincoln were few examples. What more to say, Jesus christ was killed in history. That means don't expect that people will stop criticizing. A good man will always criticized by the evil one and an evil will always be critisized by the good man. That is an underlying rule in the world. Whatever we do there must be someone there to blame you. Don't let others opinion break your inner happiness. Another lesson we can learn from the madman is that he don't spend his time to impress others. All people are different, they belong to the different religion, they possess different beliefs, different tastes, some are wise, some are fools. So how do you think you can impress all these people with the same idea. And that is 100% sure, not everyone is going to entertain your beliefs. A great philosopher like him saying something which is not practical. Not only Friedrich Nietzsche . So many other thinkers are justifying the practical possibilities of this. There are so many quotes you can see it on the very front page of google. What matters here is how much do you invest in positive thought patterns. Don't forget about the Cherokee grandfather. Here keep in mind don't get upset when people blame on you. The teacher here is an insane man. Don't worry about the teacher, the wise learns from all. Ancient eastern scriptures compares an enlightened man to a little child. Children are happier, aren't they?. They don't care worldly problems spending all the day busy with something they like. They don't seem to compare themselves with others. They are very creative and curious. They keep trying for what they want. What happens once they accomplish something they try. Still, don't care about it, but instantly moves to the next thing.No other people or the external world has no interference to his mind. Just as the wise. Children usually express high dreams until they get demotivated by the society when they grow up. An enlightened one is someone with all the positive qualities of an innocent child, but a learned one. For a person of above kind, People tends to believe something is wrong with them. All great man ever lived on this planet has some touch of madness . Many thinkers look weird in fact. I think it's because they don't care how they look or they have no time to care about it. Just as the little child doesn't care about dirt and mud in the middle of his playful activities. When talking about real educated humans. They see the world much differently than us. It's all about how they feel, how they see things. We can only read and listen to them. We can't experience their feelings and emotions. People are different because they think differently, so as they feel. People want others to think like them, They want others to agree with them. They hear things what they want to hear. That is the basic character . We can simply conclude people are not reasonable by nature. But A wise man is who is reasonable, who don't want others to be like him, He is the learned one to accept other people as they are. So he is entirely different. Nobody likes a person who is different, who thinks differently, who behave differently. They labeled the wise man as a stupid one. They think he is insane just because they can't comprehend his character. But the wise live his life happily, without having any complaining anything about life. Only concentrating on his own ideas and thought. Some people are still infamous because of their great teachings irrespective of the century they lived. Can you believe that "buddha" lived before 2500 years before? Every day we read something about him on the internet. Not any artist or king are infamous as these great sages. Why ? well, I remember something Which is told by 35th president of United States John F Kennedy "A man may die, nations may rise and fall, but an idea lives on". Have you read about the personal life of Buddha? He was an Indian Prince whose early name was Siddh?rtha Gautama. Later on his life, he left his kingdom for the pursuit of knowledge. And that is so much more than insanity in the society. Well, Buddha is personalized as a peaceful human living in ecstasy. Buddhism teaches about serenity and contentment of mind. A believer of Buddhism shall not be seeking for wealth and possessions. They teach the source of miseries are from the intense desires of the human mind. Hence, Buddhism practice disciples not to attach with material belongings and desire. Once they attain mastery on instructions, he is supposed to be an enlightened one having no worries.